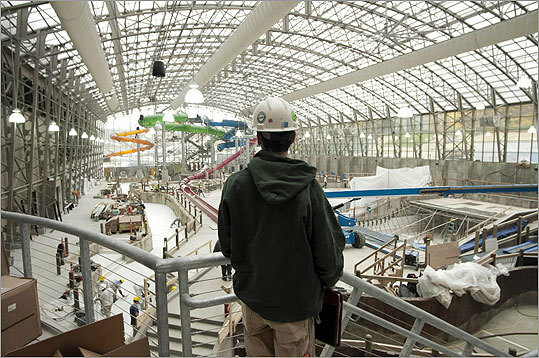 a year-round attraction that will include a water park. JAY, Vt. - Birinder Bhullar had grown weary of the long business trips between his native India and the United States, so he decided to make his home in New York. But the white-haired former engineer soon realized that he would have to wait years for a visa to move to America. the system helps both works and investors. Instead, Bhullar and hundreds of other wealthy immigrants found a faster way into the United States, through a ski resort in Vermont. In exchange for investing $500,000 in the resort to create jobs, the US government gave him a green card three months ago. The 55-year-old businessman is among 450 investors from India, China, Russia, South Africa, and dozens of other countries who obtained the green cards through their investments in Jay Peak Resort, part of a controversial national program that the Obama administration is increasingly promoting in hope of creating thousands of jobs across the United States. The immigrant investor program, created in 1990 by Congress to compete with a similar initiative in Canada, helps foreigners slash through the red tape in the US immigration system while allowing businesses such as Jay Peak Resort to raise the money they need to expand. With job creation now a top political issue and traditional sources of capital hard to find, the program is being aggressively marketed to businesses and potential foreign investors. It has incited critics who condemn it as a questionable business practice or as an immigration policy that effectively allows some foreigners to buy their way into the country. But it has also created jobs in places like Jay, a tiny town 3 miles from the Canadian border in a county with one of the highest unemployment rates in Vermont. Every spring, the resort’s owner, Bill Stenger, would have to lay off workers. But through the program, he has raised $200 million in the past few years to transform a modest ski resort into a glitzy year-round attraction with an ice rink, golf course, two hotels, and an indoor water park. Most important, he said, they plan to have 800 full-time, year-round jobs, up from just 150 five years ago. Some critics say they fear that immigrants will pay little attention to their investments because they are motivated by green cards. US officials say they audit the program and demand business plans and job projections up front. To enroll, foreigners must invest $1 million in businesses anywhere in the United States and create 10 direct jobs, or they could invest $500,000 in a rural or depressed area and create 10 direct or indirect jobs. It takes about eight months for the government to issue visas to immigrants and their immediate relatives. The immigrants then receive conditional green cards that become permanent after two years if jobs materialize. After five years, the immigrants could apply for US citizenship. Immigrants whose ventures fail could lose their money and be deported, but US officials say interest in the program is soaring: About 3,300 people applied for visas last fiscal year, triple the number in 2009, according to Citizenship and Immigration Services, the Homeland Security agency that runs the program. The 41,000 jobs created under the program since 1990 is a tiny fraction of the US economy, but at a time of desperation to show job growth, officials see the program as a way to help. The agency has never come close to the 10,000 annual cap on visas; the peak was in fiscal 2009 when the agency issued 4,218 visas. Most immigrants participating in the program invest through a US government-approved list of investment pools that can provide capital to a number of business enterprises. The list has exploded from 11 pools four years ago to 179 now. The only Massachusetts investment pool launched its first project in the spring, refurbishing a New Bedford building into offices to create at least 80 jobs. The group is also courting investors in China for a battery manufacturing plant possibly for Boston, said John Downey, a lawyer and president of the pool. New Hampshire also has an investment group that won federal approval last month for a project to build lodging and other amenities at Ragged Mountain ski area. In Jay, a town of 500 people with a country store, a gas station, an auto shop, and not much else, the immigrant investor program is transforming the largest employer in town into a year-round enterprise. But others in this mostly white, conservative, blue-collar town are grateful for the work, even if they are unsure about the program. Michael Witkowski, 23, an electrician, was stuck working the midnight shift as a gas station clerk in Connecticut until he found a job at Jay Peak. Anthony Korda, a lawyer and early investor who brought his wife and two children from England in 2007 and lives in Florida, said the program is helping both groups, workers and investors. “For us, this is the only way that we were going to make this work,’’ said Korda, 50. One day this month, the need for work was vividly on display at a job fair at Jay Peak Resort. Dozens of people, some with children, poured into a hall to fill out applications for jobs as janitors, cooks, and clerks. Reprinted from The Boston Globe of Tuesday, October 25, 2011.